New York's King Street Sounds have been active in resurfacing Kerri Chandler material from the late 90's, and we're now onto the third instalment of the series - a straight-up thumbs-up from us here at Juno Towers. "Harder Gets Higher" is a stone-cold Chandler banger, and here we have the original mix in all its funky, moody glory powered by masterful tribal beats and deep, sweltering bass. "Grass Cutter" features on its '623 club mix' and, again, Chandler is supreme king of the bassline, but its his dub version of "Awareness" by Canada Project that works particularly well on today's dance floor - a minimal, stripped-back groove with icy chords and a warm vocal carrying all that weight through. Sickness. 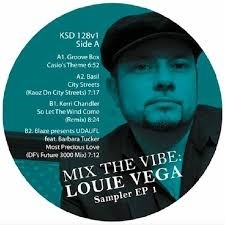 Sampler of NYC house legends finest works from King Street Sounds. 4 of the finest deep cuts from the legendary duo who have worked with 4th Floor, Henry Street and Nervous records.